US adults will spend an average of 3 hours 14 minutes on their mobile phones in 2017, eMarketer estimates. The devices’ small screens, powerful cameras and shorter sessions favor visual media—which is also the fastest growing media. The deep-learning technologies that enable computer vision have advanced quickly in recent years. Several companies have helped in this effort, but Google and Facebook in particular pushed it forward with their decision to open-source some of their technology. Deep-learning technologies let ecommerce sites interpret and group images, which makes for better product recommendations and searching products via pictures. Image and visual search also make finding similar or related products easier. Augmented reality leans on similar technology and has been successfully applied in ecommerce to reduce uncertainty in purchases, even in this early stage of the technology. 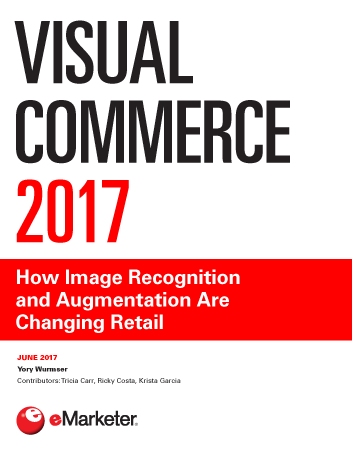 "Around three-quarters of US internet users regularly or always search for visual content prior to making a purchase; only 3% never do."